One of the most exciting things about being a regular food blogger is that it has the potential to open up a whole world of ingredients that you never before knew existed. Of course, the word ‘chard’ has always been a member of our vernacular, but it’s never been clear to me quite how many varieties of it there are. Happily, such variety ensures that gastronomic inspiration is unlikely ever to go wanting, especially since one can always fall back on one’s ability to invent, adapt and experiment. One has only to wander into one’s local butcher or green grocer to fully appreciate the diversity of even the most local of produce. For instance, this morning I discovered a green grocer I had never before visited and before I’d even had time to take stock of my delicious surroundings several new recipes had forcibly entered my grey matter. However, it should go down on record that they were extremely welcome and particularly frugal guests. 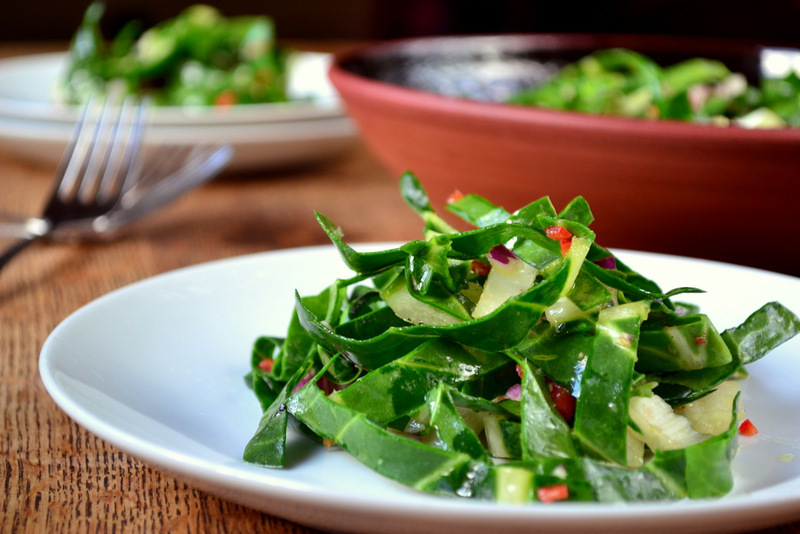 Chard salad seems to be a dish only rarely attempted, which is a real shame because it possesses an exceptionally delightful body and flavour. Indeed, its texture has an incredibly satisfactory bite and comes across as exceedingly hearty – a trait which many salads lack. Please do not even attempt to bring a hunk of bread or even cheese near this salad; I wasn’t joking about its bite. Though chard is an ingredient usually used in Mediterranean cuisine, it is readily available in Britain even in November. Indeed, I had no trouble finding locally produced chard in the aforementioned green grocer and a different variety will soon be making its way here very soon! I think you’d be surprised about what is available locally in your area, wherever you live – one simply has to look in the right places. For instance, city farms are a more frequent occurrence than you may be aware of – there are two in Bristol! Get out there and enjoy what your own soil has to offer and do it frugally! 1. Slice your Swiss chard into ribbons roughly 1cm thick. Mix everything else separately and then bring together in a large mixing bowl. It’s as simple as that, but make sure the dressing covers every single strand! Cost: This is one delicious salad and chard is available at a very reasonable price. The entire bowl full of salad which is easily enough for four should set one back no more than £1.50 – an absolute steal! Last year our beet seeds were mis-labeled and we ended up with 2 large beds of swiss chard…(and no beets!) I wish I had this recipe then but will certainly add it to my collection now! Well, it’s here if any further mishaps occur! Lovely to see the chard used raw in a salad. I really like this and that it’s a fresh take on a classic pairing, greens and vinegar. I’ve never cooked with swiss chard, usually do turnip greens or kale. I’ll have to give this a go. We don’t have swiss chard, but Katherine just made a version of this with kale. She wasn’t sure if it’d work with kale so she chopped it roughly. We’re going to use your method next. Anyway, it’s really good! Kale is fairly similar… good and tough! You are absolutely right, Frugal! You have posted so many recipes that use ingredients or techniques or flavor combinations that I have never heard of. I love being exposed to all those new things through the blogging world. Well, it work very well :D. Most vegetables and leaves can be eaten raw if they’re prepared correctly! Haha! Perhaps if you very thinly sliced it and drizzled it with olive oil? Haha, indeed! I do 😀 – I need to watch myself some more Monty Python! True… I have neither of those things. I think perhaps I’ll give cider a go when I actually have some space! I have never tried chard before. This looks delicious! Thanks Jessica, get some – it’s very frugal! I need to make this! It looks so fresh and beautiful! So simple and tasty and colourful! oh i can kick myself! made a swiss chard curry flavoured stir fry which was just sublime this afternoon. and dressed it with a lemon which took it to another level. stellar vegetable. and the colour just lifts ones spirits. Thanks – that sounds really delicious! Looks delicious and I love seeing it raw in a salad! My grandmother (originally from Italy) would cook it all the time. I loved it. But I love this even more. Looks like a healthy perfection, simple and yet elegant!! Swiss Chard is to me the Cadillac of greens. Kale? Collards? Meh. Swiss Chard? Hello! My mother’s new nickname is Swiss Chard. I wish I were kidding. Love, love, love chard, raw and cooked – I grow rainbow chard. The local rabbits adore it too…. 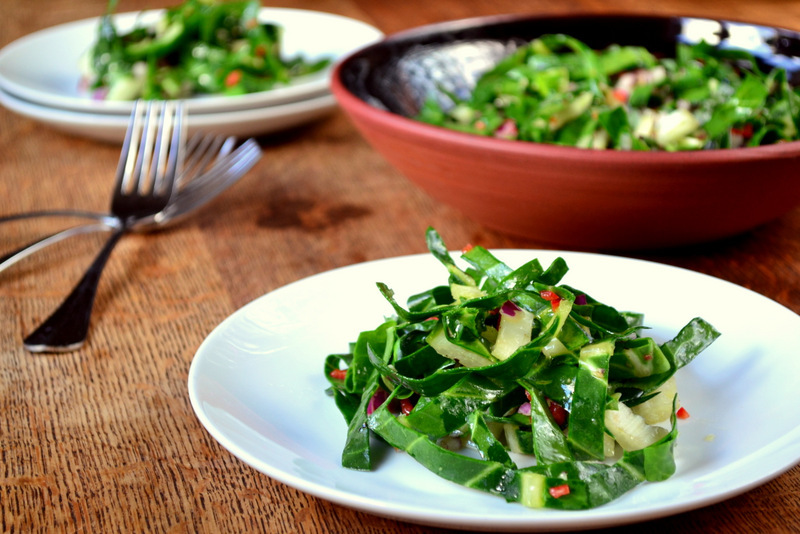 Lovely salad recipe, I am always desparate for salad ideas in autumn/winter. I will give it a try. I think this may be right up your street! I have no idea! Is that an American term for something else? That sounds great! 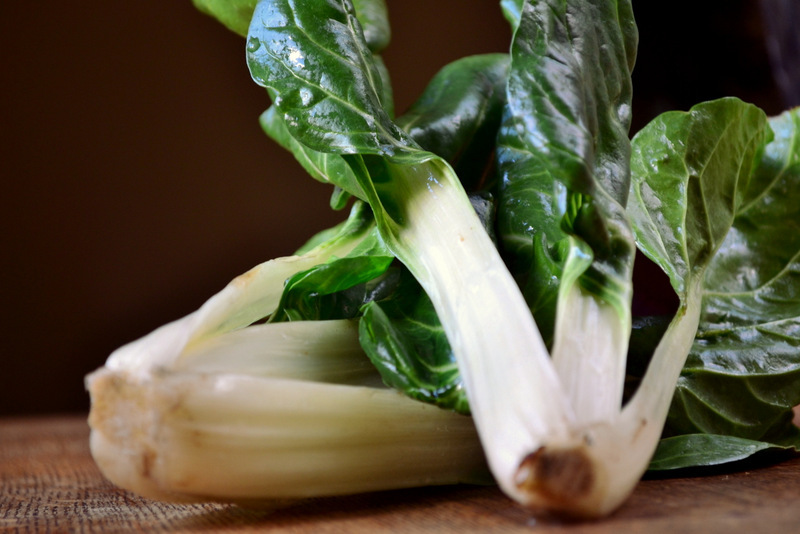 Is Swiss chard similar to Chinese large bok choy? It’s looks so much like it and I do eat bok choy (minis up to the extra large ones) very often. Interesting recipe to try out as I’ve never had it raw before. Umm – not really, though they do have a similar look. Bok choy is a little more crunchy and doesn’t have quite so much flavour. Chard is almost cabbagy. I did a salad with bok choy recently! I find it is often easy to be more frugal than usual by shopping in smaller places. For example – my local fruit and veggie store sells 8kg bags of onions for about $6 or so, whereas in Coles a 1kg bag can cost $3.. . My local Asian grocery store sells udon noodles – four packs for $3 whereas Woolies sells two packs for $3…. Looks like a Christmas wreath. Nice photos. I suppose it does a little – thanks, Rosemary! It’s the one one North Street in Bedminster, almost opposite the tobacco factory! It’s a great little green grocer! This salad look so good! I’ll have to pick up some chard at the Farmer’s Market this morning. Thanks! Yes, it’s rife at the moment! Awesome presentation. Your dish looks yummy and most importantly healthy . 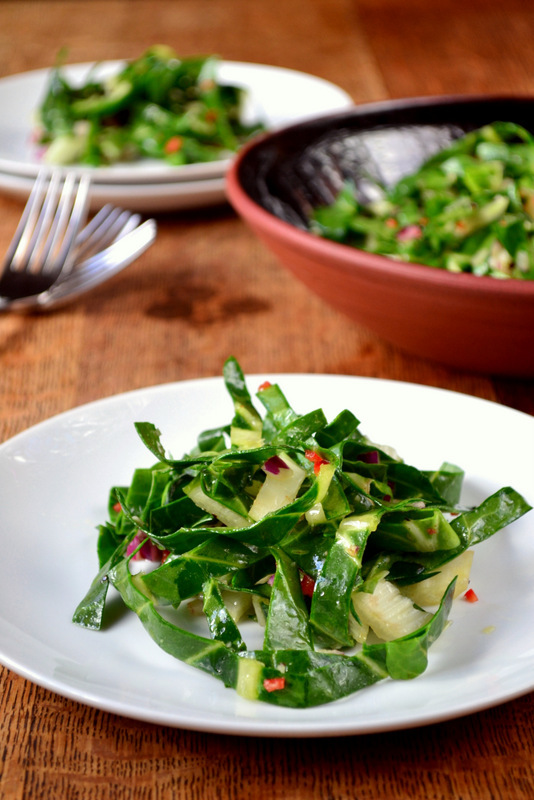 I use chard quite often and I love it! Thanks! I’m so glad you think so! Love chard; it’s my go-to green. give it a go and the cider vinegar works perfectly! Can you please convince the Pie that it’s worth eating? I grew up on the stuff but he won’t touch it. Tell him that I told him that it is! Oh this look so fresh and good! Beautiful photos! 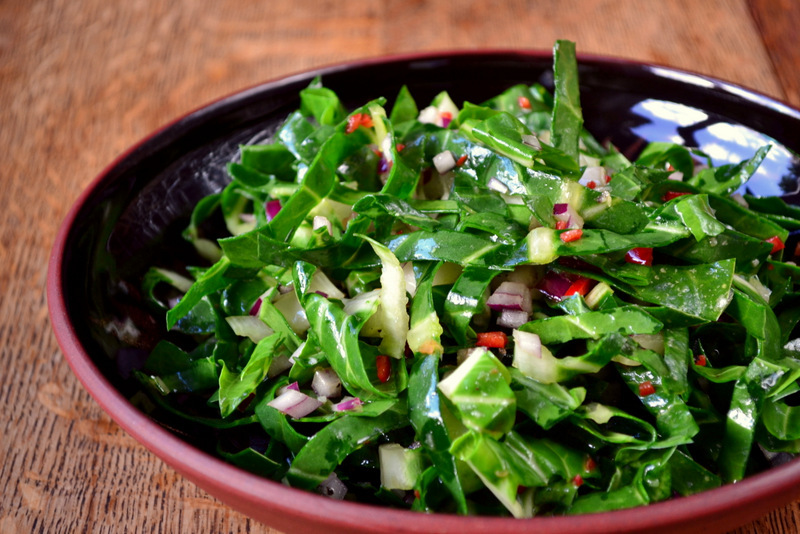 I love the earthy flavor in chard – I am sure that salad is wonderful! Thanks! It very much was! Swiss chard is such an amazing veggie! It’s full of calcium, vitamins, and other minerals. One great thing about swiss chard is that it’s very easy to grow. I have seen it not only survive, but thrive in cold and snowy weather. Just brush the snow away, and there’s your swiss chard, looking for all the world like it’s enjoying balmy, tropical breezes. Thanks for sharing all the good things you do. I enjoy reading your posts. It is indeed! I have a rainbow chard recipe too, soon!It is very hardy – I’m glad you like my posts! It’s also ridiculously easy to grow, if you have any garden space at all. Also, have you tried rainbow chard? Hot pink or orange or red or yellow stems and veins – glorious! Indeed it is! I have… rainbow chard recipe incoming! This salad has minimal ingredients but is delicious . Elaine K., I think you would love it! And everyone, this could easily make up half your plate of veggies! Wow- I have never heard of chard before! I didn’t even know it existed! I think the simple dressing with the chile sounds incredible. I’ve always sauteed swiss chard or used it for veggie rolls. I love the idea of it as the star in a salad! And what a star it was, Somer! It shone right out! Nice recipe and nice price too! This looks amazing! And thanks for visiting my blog. Hello, thanks for visiting my blog. I have just had a very quick peek at yours and I am very taken with the photos. We often grow Swiss Chard and love it. I just wish I could convert my Mum and children! We had a bit of a fail with our growing this year but I must remember next year. I am always amazed by how hardy it is. Anyway, I’m blathering – nice to see a UK blog.